We value our patients loyalty. For our patients without insurance, we’ve created our membership club to simplify and save you money. Plus our loyal members save 15% on all treatment. You get the care you need more affordably by eliminating a 3rd party. Join our membership club and start saving today. After I have signed up when can I get treatment? Starting now. Sign-up and call or message our office to make an appointment. We accept Credit cards and Debit cards including Visa, MasterCard, Discover, and American Express. 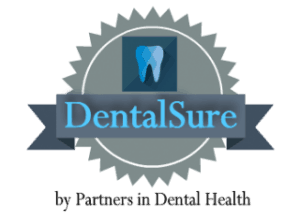 Call our office and tells us you are a DentalSure member. We’ll make sure your membership is active and you will be eligible for instant savings off our regular fees. Can I use the membership with other Dental offices? Can I get a refund for payments made? You’ll pay only the Activation fee to join. This fee includes your first month’s membership dues. How do i check my account or cancel service? Login to your member portal and you will see the status of your account. Membership clubs are not insurance but a payment arrangement provided by Partners In Dental Health LLC for services rendered. Membership is not transferable to other dental offices. Payment for any treatment is due at the time of service. Membership discounts start after Membership is activated. Membership dues must be current in order to receive services. A lapse of 28 days in dues will require a reactivation fee of the missed dues. DentalSure membership has a one time lifetime activation of $50 and requires 5 payments of dues which will be spread out over 6 months and your membership will continue automatically with continued dues paid monthly. Membership club discounts may not be combined with any other offers or discounts. It is solely the patient’s responsibility to schedule and keep their appointments. No refunds will be provided for dues paid under any circumstances, including failure to schedule and maintain appointments. A patient member’s monthly agreement is with the legal entity of Partners In Dental Health LLC. Monthly dues and fees for dental services may change at any time. Payment management services are provided by Rerun.